I was a fascinated by the phenomenon of the viral videos on web and by their extreme performative nature. Everybody has the possibility to be a “solo show man” and make profit, just putting his video on YouTube. Especially in the US, you can earn 1 dollar every 100 views. Major big international companies are involved in this system: they are interested in inserting their commercial adverts before the most popular videos. For many young people, most of them without job, that is a quick way to make money: they upload on YouTube their personal spectacle – like a sort of private theatre. In 2007 Chris Crocker recorded himself while he desperately cries and shouts to leave the pop star Britney Spears alone. Referring to the harassing attention of the media directed to the pop star’s personal life and career, this performance reached 4 millions views in only 2 days on YouTube. Crocker became an Internet celebrity and the video has been imitated and parodied by countless all-aged YouTube users who transformed the phrase leave breatney alone in a sort of refrain that has been changed from time to time using different names. I sent an e-mail to the users who best interpreted Chris Crocker’s performance, in which I congratulated and informed them that their videos would be part of a work of art. In the GAM ground floor the videos were overlapped and simultaneously projected in a sort of dismantled cinematographic where the parody seemed to make way for a tragicomedy. 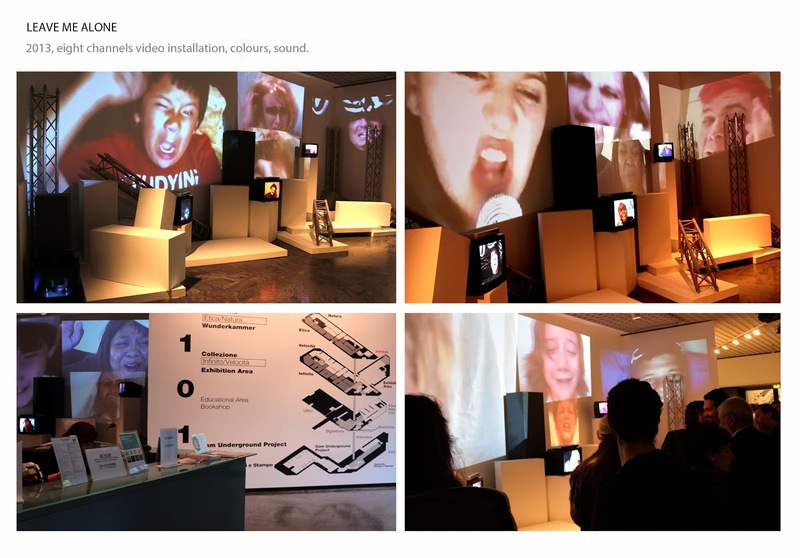 Leave me Alone, 2013, eight channels video installation, colors, sound.